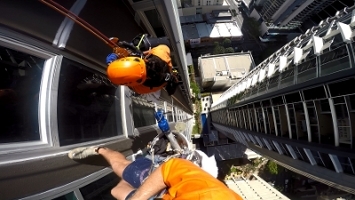 Bells offers high rise window cleaning and general building cleaning solutions using industrial rope access (known to many as abseil cleaning), elevating work platforms and reach and wash techniques. Our window cleaning contracts range from some of the highest office blocks in the country through to residential towers, penthouses and atriums for some of the biggest landlords in the Queensland, New South Wales and Papua New Guinea. Bells internationally certified rope access (abseil) technicians are able to tackle all building sizes and shapes from high rise buildings to smaller commercial offices making sure your view stays clean and clear, while reducing strain on your heating/cooling system. Elevating work platforms allow our window cleaners to reach high windows where a rope access system isn’t available, getting them up close to achieve a quality window clean. Using advanced water filtration units combined with long reach extension poles, our operators can clean windows where machinery can’t reach and rope access isn’t feasible. Dirty Windows? Looking for a window clean? Or send us a message and we’ll contact you ASAP.